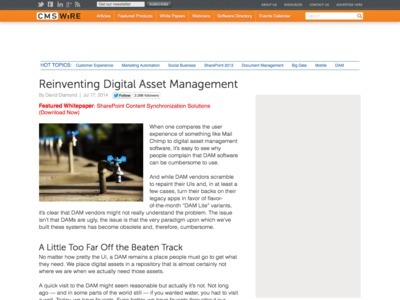 Tim Strehle’s links and thoughts on Web apps, managing software development and Digital Asset Management, since 2002. “No matter how pretty the UI, a DAM remains a place people must go to get what they need. We place digital assets in a repository that is almost certainly not where we are when we actually need those assets. […] We want digital asset access, not from some random website location, but from within our apps and anywhere else we happen to be — Google plus, a Disqus comments thread, Facebook, Twitter, etc. […] Best-of-breed enables customers to choose which system components they prefer. Instead, we are now seeing vendors buy up and package complete suites for us to consume, lock stock and barrel. […] DAM became about marketing for some DAM vendors when they realized that marketing departments had more money than universities and museums.